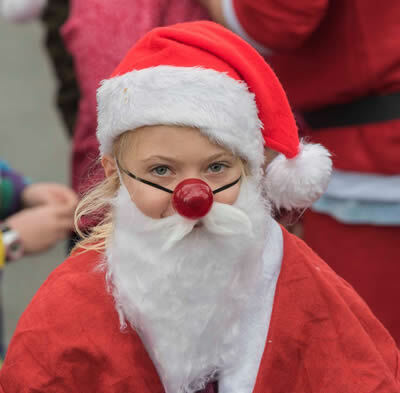 Romiley and Marple Lions held their ninth annual Santa Dash from Marple's Memorial Park to Marple Garden Centre on December 3rd, 2017. 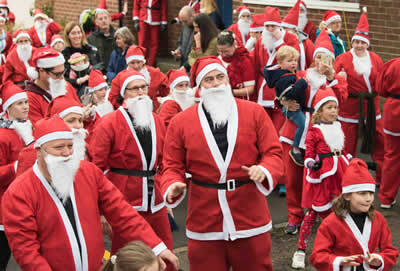 An excellent turnout saw over 220 Santas taking part in the fun. Sponsorship this year is going to Kidneys For Life who were represented by Carol Boneham and her team at the event..
One Lion who was very much missed this year is Ian McBryde, who sadly and unexpectedly passed away on September 15th 2017. Ian first joined Lions in Kington, Herefordshire in 1987, moving to Romiley and Marple in the early 1990s, where he served as President from 2000-01. Ian and his wife, Janet, have been invaluable members of the Santa Dash team since the event started in 2009. Ian had been a keen, active supporter at many Lions' events over the years and his knowledge and experience were a great asset to the club. Pictured below are: 1. The runners set off from Marple Memorial Park; 2. A Santa runner! 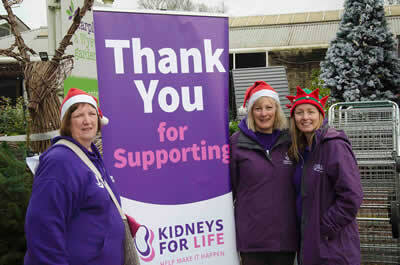 ; 3 Kidneys For Life team who greeted everyone at Marple Garden Centre; 4. 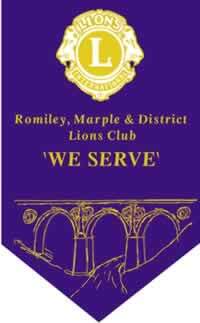 1196 Bredbury, Romiley & Marple A.T.C. who marshalled the event. 5. Much missed Lion member Ian McBryde seen on the right starting the runners at the 2016 event.